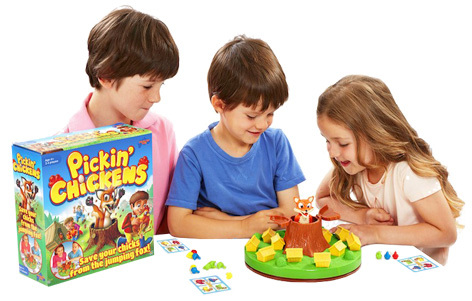 Well known as the makers of a great selection of children’s action games, Drumond Park introduced Pickin’ Chickens (RRP £19.99) to their portfolio in September 2016. Designed for youngsters age 4 and over, there are two levels of play to suit slightly older children as well. 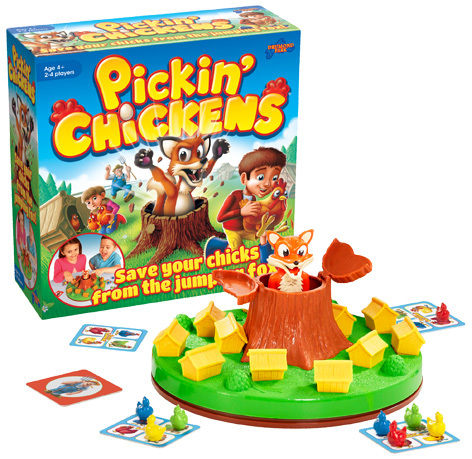 The aim of the game is to ‘Save your chicks from the jumping fox’, and what fun kids have as the pesky predator randomly bursts out from his tree trunk lair! Holders of the elusive Farmer Card are protected from losing a chicken when foxy pops up, but others aren’t so lucky. You have to collect four chickens on your card to win the game, but it’s not so easy as it sounds. In the Young Chicks version, players can collect any colour chicken, whereas in the Older Chicks game they have to collect specific colours. Pickin’ Chickens challenges youngsters’ memory skills as well as helping them learn colours, make decisions and most importantly, teaches them to wait for their turn! The simple-to-learn format means that children come back time after time for another game. Please tell us what you think of Pickin’ Chickens by Drumond Park.